I keep reminding myself that we’re only 4 games into an 82-game season, and there’s still PLENTY of time for the Jazz to figure things out. Still, watching them completely fall apart in the 4th quarter of consecutive games is disheartening to say the least. With Utah trailing Houston by only 3 points at the end of the 3rd period, the Rockets outscored the Jazz 34-20 in the 4th to win easily, 113-96 on Monday night in Utah. On Tuesday, the Jazz took a seemingly safe 15-point lead into the 4th quarter in Dallas. They then proceeded to give up 29 points in the final quarter… to Dirk Nowitzki alone! As a team, the Mavericks outscored the Jazz 44-18 in the 4th to win 96-85. Game ball goes to: No one. Seriously. Yes, this is me taking my ball and going home. Stat of the game(s): The Jazz have now lost 3 of their first 4 games. In those 3 losses, they have been outscored in the 4th quarter by a combined total of 110-63. Ironically, the Jazz outscored their opponents by a combined 223-213 through the first 3 quarters of those games. Highlight: Andrei Kirilenko averaged 15 points, 6 rebounds, 3 blocks, and 2.5 steals in the games against Houston and Dallas. While he still seems out of sorts at times on offense, it’s good to see him putting up defensive numbers again. 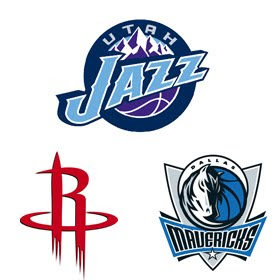 Lowlight: Tough to choose between giving up 34 4th-quarter points and losing at home to a Rockets team that is playing without Yao Ming and Tracy McGrady, or blowing a 16-point 4th quarter lead in Dallas and allowing a single player to outscore your entire team by 9 points in that same period. Let's call them equally pathetic. - Utah’s interior defense is atrocious when Boozer and Okur are on the floor together. Either one of the two needs to be traded, or Sloan needs to change his substitution patterns. I’m honestly not sure which of those two scenarios is more likely. - Heading into the season, power forward was the last position on the team I was concerned about. Unfortunately Boozer and Millsap have both been terrible. Boozer is shooting 35% from the field and has only scored more than 12 points once in the first 4 games. Millsap looked good in the first 2 games but was awful in the last 2, averaging 3.5 points, 5.5 rebounds, and 5 fouls in 23 minutes. You would expect a little more from a PF combo making over $20M this season. - The Jazz desperately miss the outside shooting of Kyle Korver and CJ Miles. When your center is the only player who can stretch the defense, you have issues. 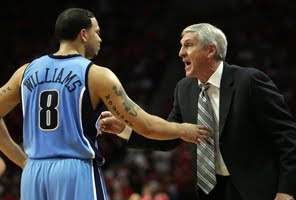 - Deron Williams has been over dribbling and forcing a lot of shots the last couple of games. I’m sure this is partly due to the fact that he doesn’t have many other reliable scoring options. There doesn’t seem to be a lot of trust or chemistry on this team right now, offensively or defensively.